Project supported by the Geneva Study Group on Noma , funded by the Hirzel Foundation. Noma is a gangrenous disease leading to mouth and face tissues destruction. This disorder occurs almost exclusively in children of less developed countries, and in population suffering from poor hygiene and malnutrition. Recent studies have shown that the disease has a global yearly incidence of 140’000 cases and a mortality rate of approximately 90 percent. Oral cavity flora is composed of a wide variety of microorganisms, that are commensal, potentially pathogenic or, for a vast majority, simply uncultured or unknown. 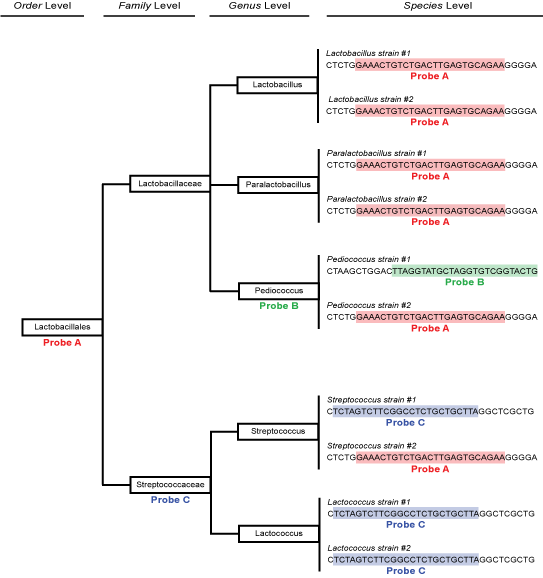 To identify potential bacterial etiology playing a key role in the development of noma disease, we developed an original microarray allowing phylogenic analysis of complex bacterial mixtures constituting the clinical sample. The microarray is composed of ~10’000 probe features containing 16s rDNA specific probes. Probe design was performed by selecting oligonucleotide sequences specific to nodes matching each level of the phylogenetic tree (domain, phylum, class, order, family, genus, specie). Fig. 1 : Schematic representation of the probe selection process on a small subset of 16S rRNA gene sequences. Copyright © American Society for Microbiology. This approach, based on sequence information, allows analyzing bacterial contents of complex bacterial mixtures including known and also unknown microorganisms. The presence of unknown organisms can be simply suspected and mapped on the phylogenetic tree, then indicating nodes to consider in the analytical process. This approach is being used on a panel of samples originating either from noma patients or healthy controls from identical ethnical groups and geographical origins. Initially developed to study the gingival flora, the same strategy can be used to monitor various bacterial communities such as environmental (wastewaters, sludge, soil, etc. ), medical (gut flora, skin flora) or food industry samples. Fig. 2 : Microarray Coverage for each of the 32 Phyla. About 80% of the 16S rRNA Sequences are Covered by the Current Probe Set. A Novel Microarray Design Strategy to Study Complex Bacterial Communities. Huyghe A, Francois P, Charbonnier Y, Tangomo-Bento M, Bonetti EJ, Paster BJ, Bolivar I, Baratti-Mayer D, Pittet D, Schrenzel J; the Geneva Study Group on Noma (GESNOMA). Download the Poster presented for the Swiss Society for Microbiology Annual Congress.